An application to give listed status to the Coronation Street set, which would help secure its future when it is vacated next year, has been refused. The ITV soap is due to move from its current home in central Manchester to a new site in Trafford next spring. English Heritage said the set, which has been used since 1982, was not historic enough to be listed. Listing would restrict how it could be altered. ITV is selling the former Granada plot and the set’s future is uncertain. The broadcaster is considering all bids but has told the council it is looking at whether a tourist attraction based around the famous terraced street would be viable. 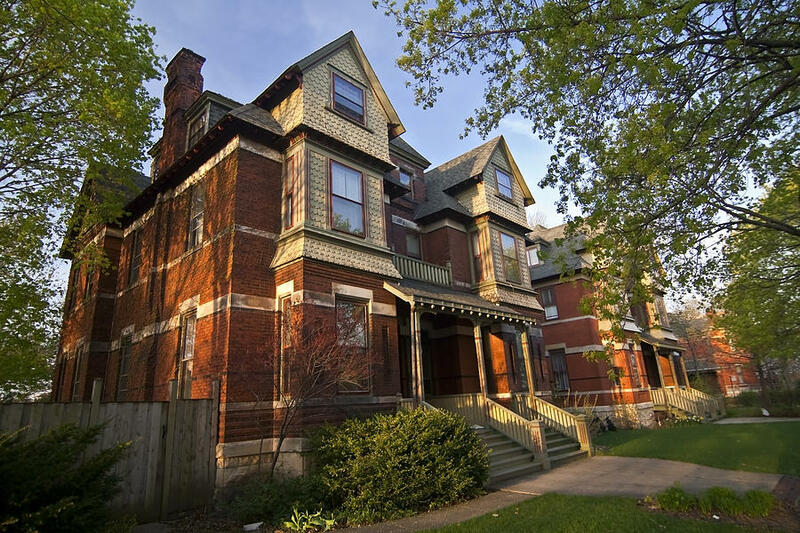 Listed status is given to buildings of special architectural and historic interest, but a building has normally to be at least 30 years old to be eligible. A statement from English Heritage said the current Coronation Street set was “certainly unusual”, but added: “However, the criteria against which we must assess the architectural significance of buildings – or in this case, a television set – is extremely strict. “The oldest buildings are just less than 30 years old – and most do not have interiors and therefore exist as facades, most of which have been altered. The soap, along with ITV’s other Manchester operations, is due to move to purpose-built studios at the MediaCityUK complex, adjacent to the Manchester Ship Canal. ITV did not make the listing application. English Heritage said the application was made by an individual and it was unable to reveal their identity. The Granada set did become a tourist attraction in 1988 and the tours are fondly remembered. But they ended in 2001 after visitor numbers dropped and Coronation Street’s filming schedule increased. We are leading a campaign to oppose the development of a marina at Brandy Island, on one of the most unspoilt stretches of the River Thames. Brandy Island adjoins the beautiful village of Buscot in Oxfordshire, which we have looked after since 1956 to protect its special character. The island is a rich wildlife habitat and its setting has attracted walkers, artists and all who love the riverside for centuries. 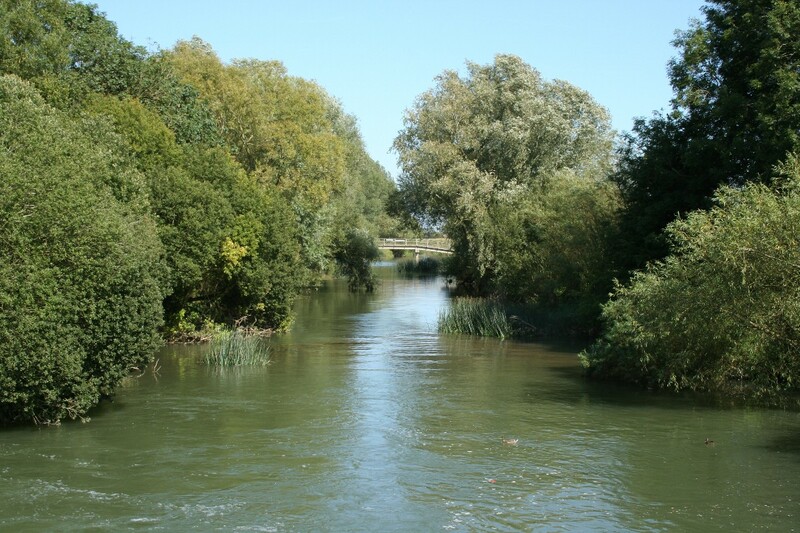 Now the peace and tranquillity of the area is threatened by an application for a commercial development on Brandy Island which has been submitted to the Vale of White Horse District Council. We are strongly opposed to the development and are urging local people and organisations to object to the scheme. Local people and organisations have until 8 June to lodge their objections to The Vale of the White Horse Planning Authority. This development would have an impact of the character of the local area, which is recognised by the Local Authority as ‘an area of high landscape value’. It would also detract from the unspoilt beauty of Buscot Old Parsonage which is a Grade II* listed historic building. The site has notable nature conservation interest and could be even more important as a wildlife habitat. Kingfishers and otters already inhabit the Buscot Lock site and we believe the habitat should be enhanced by returning the whole site to a conservation area. Traffic will rise to an unacceptable level for local residents. The access roads are very narrow and have no passing places. Buscot Lock attracts visitors throughout the year. It’s a popular picnic spot in the summer as it is a safe and unspoilt place for people to enjoy. The increased traffic will have adverse effect on the safety of the public and their quiet enjoyment of the site. 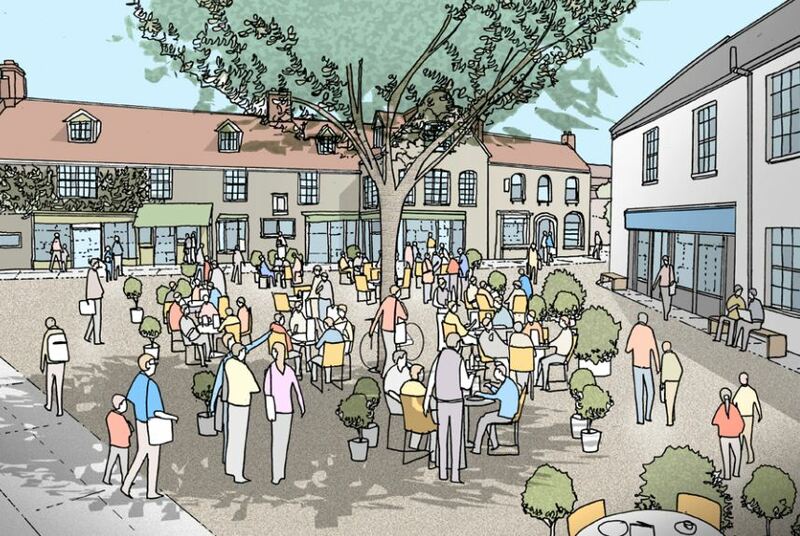 The increased traffic will add to the existing pressure on the road through the village and increase parking problems. The T junction with the main A417 is already considered dangerous and more traffic in the village will only increase the risks. The impact to residents both in the village and immediately adjacent to the site cannot be underestimated. Local residents will be immediately affected by the noise of boat owners with power tools, radios and machinery, as will all those who currently enjoy the peace and tranquillity of the area. Four houses in a terrace in a Stockwell South London Conservation Area will need to rebuild their roofs after a collapse. One of them is owned by Will Self. The writer and his family were among those evacuated after bricks, masonry and other debris fell from the properties on Tuesday evening when the roofs crumbled. Today structural engineers told residents the collapse could be a result of “diurnal drift” – which is the change in temperature over the preceding 24 hours. On Tuesday the capital experienced the hottest day of 2012, with temperatures rising to nearly 26C – 17C higher than the lowest temperature the day before. The home of the Solicitor General, Edward Garnier, MP, was among those affected. Will Self’s wife, Guardian columnist Deborah Orr, last night voiced concerns that insurers would not cover the incident. Early reports claimed the cause of the collapse could be “wear and tear”, which is not covered by insurance, but it is unclear whether the heatwave would be deemed “an act of God”, which would not be covered either. Just try challenging the Solictor General on the insurance policy fine print, just try. Is your roof insured against global warming? As the site affects a grade I asset, and as the NPPF heritage policies are so similar to the previous PPS5 the outcome was in little doubt, it harmed a grade I asset, Bunhill fields, after all, but is of interest is how the inspector weighs and balences the various issues ‘the Framework indicates that it is appropriate to weigh the public benefit against the harm‘ and in particular treats the issue of viability. Interestingly the neighbouring block of flats hired David Lock personally to represent them. A key indirect factor in the appeal was antient lights and the developer had to set aside a contingency for this so that even with public funding the affordable housing would vary via cascade clauses between 23% and 60%. The inspector concluded rightly that right to light and compensation were matters outside planning concern and that loss of light would not be unusual for the area, but together with the harm to heritage assets the harm outweighed the benefits. The appeal site is previously developed land in a highly sustainable location, close to facilities and public transport. There is no doubt that the scheme would be deliverable and contribute to the local housing stock, provide affordable housing, including family homes, create jobs, provide community floor space, and improve biodiversity and promote sustainable construction, design and travel patterns. Allowing this appeal may also ensure that the timescale for the provision of 60% affordable housing with grant funding could be achieved. However, one of the core planning principles in the Framework is to conserve heritage assets in a manner appropriate to their significance so they can be enjoyed for their contribution to the quality of life of this and future generations. The assets in this case are of exceptionally high historic and architectural interest, influencing the character and distinctiveness of the area and as such they are of very high value to the public. The appeal scheme would significantly harm the setting of the heritage assets, and the historic landscape, detracting from experience and appreciation of their heritage value to the public. In doing so, it would detract from the contribution of the heritage assets to society for this and future generations. In addition there would be harm to the living conditions of neighbours. As there would be a legacy of harm, I conclude that the appeal scheme would not constitute sustainable development and it would not comply with the aims of the Framework. Although the documents accompanying its sale in 2008 suggest potential development scenarios and the appellant is a registered charity, this carries no weight, as the site is purchased at the developer’s risk and these are not exceptional circumstances. Some additional figures have been put forward to justify the purchase price relating to the alternative uses and marketing for other similar sites. However, the data for alternative sites is basic and dates from 2009, and it not clear that it can be relied upon as an indicator of current values. Moreover, there is no background information supplied for the comparative sites referred to for the market value and it is not clear whether their site circumstances are similar. So put brutally, paying too much for a site is not an exceptional circumstance, its a risk the appellant takes. I stand to be corrected but I imagine this was a site sold by Islington itself. It would appear reading the appeal as a whole that a reduction in height and redesign adjoining Bunhill Fields should secure an approval and then this would outweigh any issue of harm from loss of daylight/sunlight. 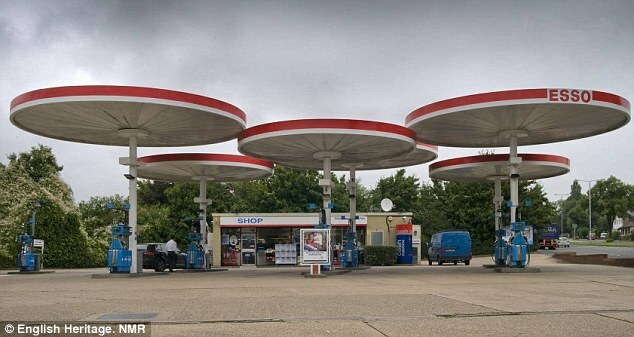 Radio 4 was slightly mystified that a 1960s petrol station has been listed however radio is hardly a visual medium is it? Eliot Noyes was one of the pioneers of modern industrial design, a pupil of Gropius and with IBM probably the designer that created the modern unity of brand and product. Noyes designed 18,000 of his classic spinning top petrol stations around the world yet now only one remains, in Leicestershire, and rightly it has been listed. Starts at 12 im told though the Agenda says 9.45. The largest ever planning application in Liverpool, 9,000 units plus, and one of the largest in history. The Agenda pack is here. Almost certain to be approved, however the key issue is whether or not it will be called it, it has to be referred. Given the DCMS treaty obligations under the World Heritage Convention they will certainly ask the DCLG to call it in. A lot of nonsense is talked about Liverpool ‘giving back’ World Heritage Status. They have no power to the signatory is the UK government. 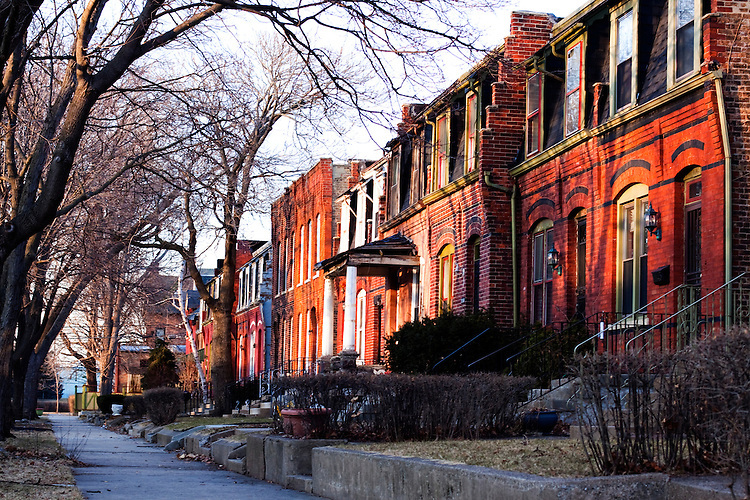 Pullman Illinois is one of the most important North American sites in the history of urban planning, its most important company town – alongside Lowell. But it has been neglected as the areas around it have declined. Now according to USA today Rep. Jesse Jackson Jr is sponsoring a bill for a study that would see the US National park Service take over. 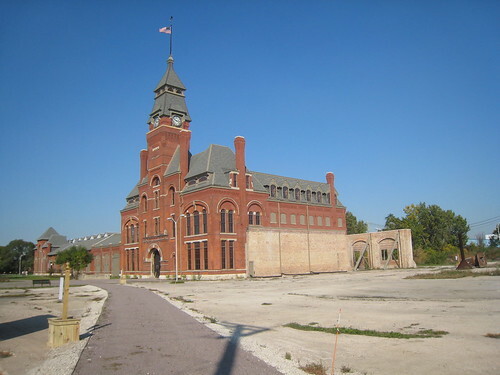 The Pullman District is an industrial and residential complex built in the 1880s by George Pullman to build the famous Pullman sleeping car and house workers in a company-owned community with homes, a church, hotel, market and recreational facilities. A strike in 1894 by Pullman workers and the formation of the first all-African-American union in 1925 helped shape the black labor movement. The African Americans hired to work in the factory and as porters allowed many to move into the middle class, and porters helped spark the historic migration of blacks from the South to northern cities by spreading the word about jobs in the North, says Lionel Kimble, who teaches history at Chicago State University. The porters’ “impact on history can’t be seen in a negative light,” he says. Jeff Soule, outreach director for the American Planning Association, says Pullman was “the first industrial city designed with the inhabitants’ welfare in mind” and included nice, if modest, homes for workers and proximity to the goods and services they needed. Planners “are trying to re-create the community that Pullman already is,” he says. 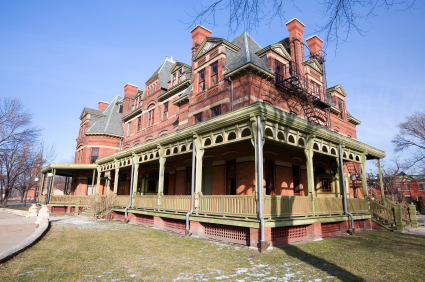 A Pullman national park site could be modeled after Massachusetts’ Lowell National Historical Park, which highlights the early textile industry, says Patrick Brannon, president of the Pullman Civic Organization and a resident. “It could have a lot of tourist draw,” he says, although some residents worry about being inundated by visitors. English Heritage has lodged a number of objections to a skyscraper plan for Liverpool‘s waterfront a month after Unesco inspectors warned thedevelopment threatened the city’s world heritage status. Peel Holdings, the owners of the Trafford Centre in Manchester and the Manchester Ship Canal, wants to develop a swath of disused dockland containing a multitude of historic buildings as part of its multibillion-pound Liverpool Waters scheme. It features thousands of flats and hundreds of offices, hotels and bars, as well as the 55-storey Shanghai Tower and other skyscrapers. The scheme envisages two clusters of tall buildings, one near the city centre and a second further north. But English Heritage has written to Liverpool city council expressing its concerns that a secondary cluster of tall buildings at Clarence Dock will introduce a large and strong vertical form that will “overwhelm the historic, horizontal character of the docklands generally”. The density of development, the mass and scale of the waterfront blocks and the height and scale of the tall buildings “will divorce, rather than connect, the two main parts of the Stanley Dock character area of the world heritage site”, English Heritage argues. It believes the development will prevent an appreciation of the relationship between the docks and river that is essential to an understanding of the site. Furthermore, it says the development will detract from the historical primacy of the Pier Head buildings and will harm the setting of the Stanley Dock warehouses by largely obscuring them. It adds: “The scale of the development will compromise and unbalance the historic urban landscape of Liverpool as a whole.” The heritage organisation also points out that there is a lack of clarity in what the Shanghai Tower development will involve, as there are contradictions within Peel Holdings’ plans. English Heritage believes it is possible to find a compromise that does not mean the city will lose its world heritage status. The world heritage status inscription describes Liverpool as the “supreme example of a commercial port at the time of Britain’s greatest global influence”. English Heritage says the dockland landscape bears testimony to this international significance. Owen-John said it was disappointing that after four years of detailed discussion, “we still have a scheme that harms heritage”. When the Unesco inspectors visited the city in November, their report concluded that the waterfront would be “irreversibly damaged” unless urgent modifications were made to the Liverpool Waters scheme. The delegation warned the skyscraper proposal would result in a “serious loss of historic authenticity”. The inspectors praised the more or less symmetrical profile of the city’s waterfront with the Three Graces – the Port of Liverpool and the Liver and Cunard buildings – at centre stage and historical docklands to the north complementing those to the south. The Graces were “at the heart of the shipping and harbour operations during the height of [Liverpool’s] glory, surrounded by dockyards and port structure”, it said. The £5.5bn Peel Holdings scheme has been a source of controversy and English Heritage has been in talks with the developer for four years attempting to find a compromise. But Unesco did not spell out what would happen to the city’s world heritage status if no changes were made to the project. It had been feared the report would recommend removing the status if the scheme was given planning permission, but it did not go that far. Peel Holdings has previously agreed to scale down the height of the Shanghai Tower to address heritage concerns. Liverpool city council’s planning committee will consider the proposal on 6 March. Joe Anderson, the leader of Liverpool city council, has previously indicated that he welcomed the Unesco report’s findings and was pressing for a compromise that would enable Liverpool Waters to go ahead. He regards the plans as vital for the future of what is one of the poorest areas of the country. Meanwhile new images have been released showing just how naff the scheme is. Artist impression showing an aerial view of the Liverpool Waters scheme which is due to be considered by Liverpool council’s planning commitee on March 6. Two clusters of skyscrapers, one near Princes Dock, and one around Central Docks. THESE images show the dramatic way Liverpool’s skyline could change over the next 30 years. Peel Holdings, which wants to transform the city’s northern docklands in a £5.5bn development, released the pictures ahead of a public exhibition to showcase the plans. Liverpool council’s planning committee will vote on the huge scheme a week on Tuesday, March 6. The two-day public exhibition opens tomorrow and will show new hi-tech graphics and video imagery of the project. Peel hopes the exhibition will galvanise public opinion in favour of the scheme which promises to create 20,000 jobs over 30 years. The project features 9,000 apartments, hundreds of offices, hotels, bars and a cruise terminal, as well as the 55-storey Shanghai Tower. But opponents believe the scheme is too big and does not pay enough respect to the heritage of the docklands, which partly sit in the city’s World Heritage Site (WHS). Unesco, which oversees World Heritage Sites, said the Three Graces would be forced to play “second violin” to this scheme if it went ahead without changes. And English Heritage, the government’s conservation advisors, have now formally objected to the project. But the body said it was for others to decide whether the “significant” loss of heritage was outweighed by the economic benefits. Peel development director Lindsey Ashworth today said: “There are overwhelming reasons why it should be given a favourable wind. “We are not disturbing any archeology, there are about 200 buildings in the scheme and every building has moved since the original application. “I have made massive compromises to the scheme and English Heritage have not made one. “I don’t think it will lose the World Heritage Site status, I am convinced that it will not. He insisted it was not in Peel’s interests to build poorly designed buildings, because they would struggle to attract tenants. He said if a public inquiry is called the company would be happy to carry on with the sister project Wirral Waters on the other side of the Mersey, which already has planning permission. Does this idiot have any idea about procedure, the SoS cannot make a decision without an inquiry, just old fashioned bullying. Terry Farrell and Partners is to make a listed building application to allow parts of Battersea Power Station to be demolished, claiming it is the only way to save the structure. The practice is assembling a team of specialists including engineer and conservationist Alan Baxter to work up an application at its own cost. It could be submitted within a month. It would preserve the most important parts of the grade II* listed power station, including the front and back walls, the chimneys and the art deco control rooms, but allow other parts to be demolished. This would reduce the cost of repairing the building from £90 milion to £25 million, said Terry Farrell. His practice published a speculative vision when the site went into administration in December. This proposed replacing the side walls with a colonnade and creating a park in the central void. In an interview in today’s Evening Standard he said: “Giles Gilbert Scott is one of the greatest architects of the 20th century and to bring this monumental temple alive again would be incredibly exciting. I believe that submitting a listed building application is the only way forward now, in order to preserve the iconic parts of the power station and unblock the ‘bigness’ that has thwarted all previous attempts to redevelop it. “The most important thing is the relationship of the mass overall to the great void inside, and I find all attempts to fill it up and to make money – whether shopping, leisure, conferencing or a football stadium – deeply upsetting.